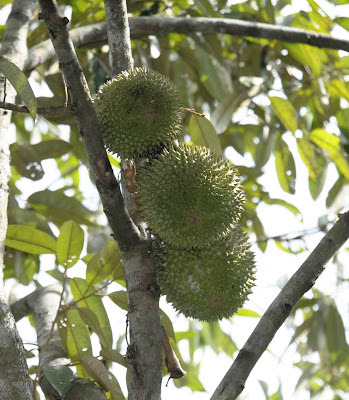 This is the season for durian, and Pulau Ubin has lot of Durian trees, attracting the 2 legged kinds into the plantation in the early hour of 4 am, hoping to find the ripened fruits on the forest floors. We were there for a different reason, to explore the intertidal area, near to the sensory trial. 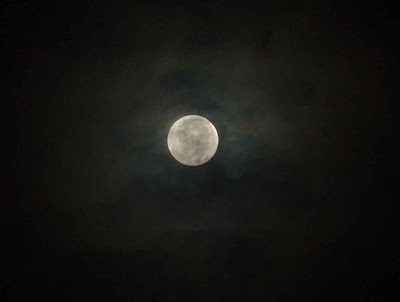 Even in the darkness of night, we were able to discern the litters that abound on the beach at low tide, bottles, plastic bags, straws etc were carelessly thrown into the water, and ended up on the shoreline during the lowtide. Seeing the mess, I know I will be in deep trouble as such mess on a sandy beach means lot of sandflies as I was wearing short and short sleeve Tee. I was not wronged, I was bitten in so many places despite protection of applying organic insect repellant. Well, I will have to refrain from scratching for 1 week! We visit intertidal area during the Full and New Moon, for this is the time of the Spring Tide, extreme low and high tides. 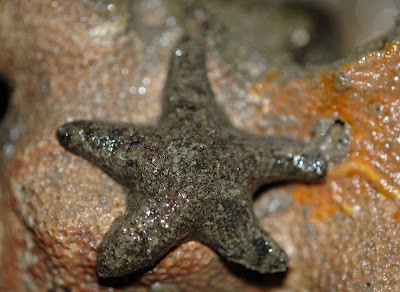 Flipping through rocks, we came across couple of stars - Sea Star. Was told that this was Rock Star, and plenty of crabs. 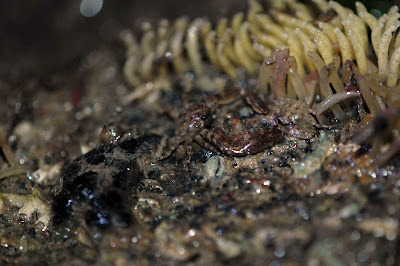 Captured in this picture was a Porcelain Crab among the eggs of Drill (probably). Plagued with tummy problem, the night before, I was not able to join the team in foraging in the further point of the intertidal area, and choose to wait out the night. 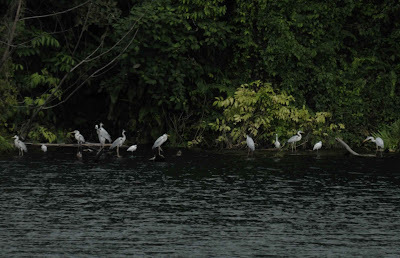 With the first light, the birds started to rustle, and soon became very active. Greetings us were birds flying in the air, and particularly this White-bellied Sea Eagle (Haliaeetus leucogaster). 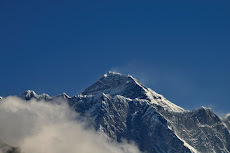 Catching the warm air, it glided as to gain height from the heat from the ground. 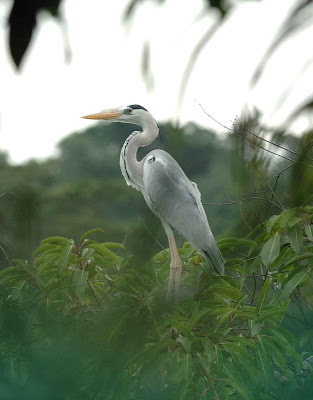 Further down the road from the Volunteer Hut, we came across a disused quarry, and there Grey Herons (Ardea cinerea) roost. I was told that it used to be alot more, but somehow the population has dropped. Picture taken through foliage, thus the blurry foreground of unfocused grass. 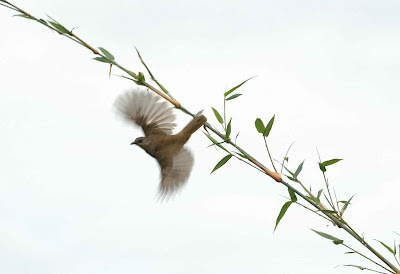 In a nearby bamboo clump, saw this Bulbul, and managed to snap a shot as it flew off. 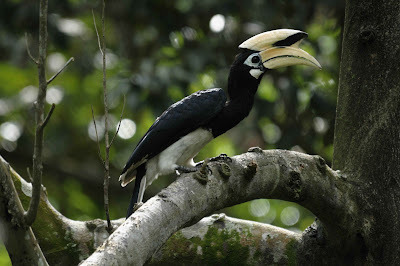 The Oriental Pied Hornbill (Anthracoceros albirostris) is also a regular visitor to Pulau Ubin, consider truly wild, these birds though big tends to be very quiet, but their black and white body simply stands out among the green foliage. 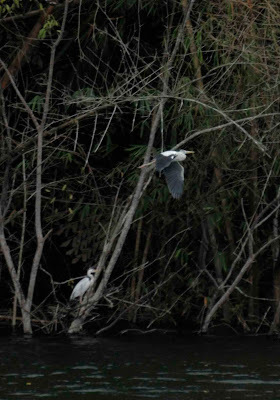 We saw 2 pairs, and manage to catch both the male and female with my camera. The horn bill beak is topped with a CASQUE, and for the male, it tends to be bigger than the female. Though it seems to be big and heavy, but the truth is that the casque is pretty light, and is actually formed in honey-combed design in the beak structure. Usually, they foraged in pairs, and for us, we were priviledged to witness 2 pairs foraging. 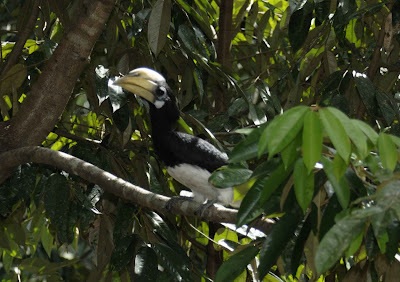 Male Hornbill with a larger casque as compared to the female below. 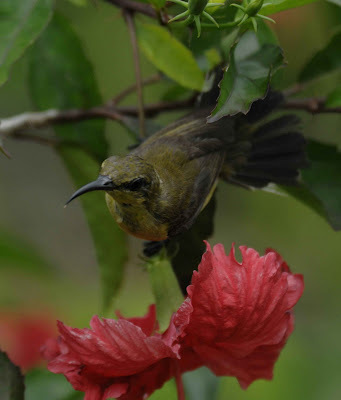 Walking to the Butterfly trail, we saw an Olive Back Sunbird (Nectarinia jugularis). Small bird which hovers and flies from flowers to flowers, it uses alot of energy just for this. 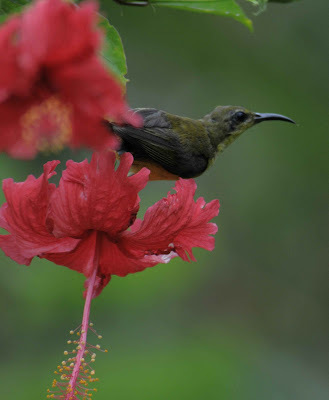 To power its flight, it needs energy drink in the form of nectar, in the picture below, it was flying from Hibiscus flowers to the next. But occasionally, when it is rearing young, it will also catch insects. I have been to Pulau Ubin many times, and each time, it will never cease to amaze me with its diversity, be it on land, sea or air. 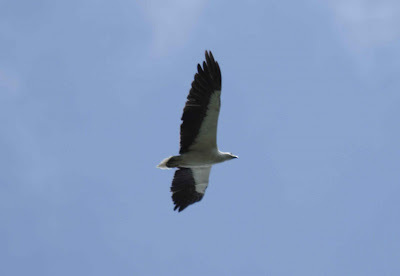 Actually, that raptor is not the Brahminy kite, but it's the white-bellied sea eagle (Haliaeetus leucogaster); you can see by the pure white underside. If it's a Brahminy kite, the belly should be completely brown. Hi Ivan, thanks for correcting the boo-boo.